Omg it's finally the day - we're having holidays and we're leaving for the mountains tomorrow..
On tuesday we chose the "Art museum of Zurich" which is a lovely building in the city to take the pictures for this post. So we will see you soon with some snowy photos! OMG! This leoprd coat and the purse! Enjoy at the mountains, lucky girls! Lovin' the hot pink pop of color against the leopard. Love the totally different looks, they're both gorgeous! So pretty! :) I love the different looks! Hi girls!! the blazer and coat are amazing! you both look super stylish. love pop of neons. The leopard coat is amazing! Love it! Your outfits are just so inspiring! Love the leopard print coat. I need that neon pink clutch! You ladies look lovely! love the leopard coat! Now I´m happy to be your newest follower on bloglovin and it´ll be great if you follow me back. WoooW! dolls.. you have an amazing sense of style! 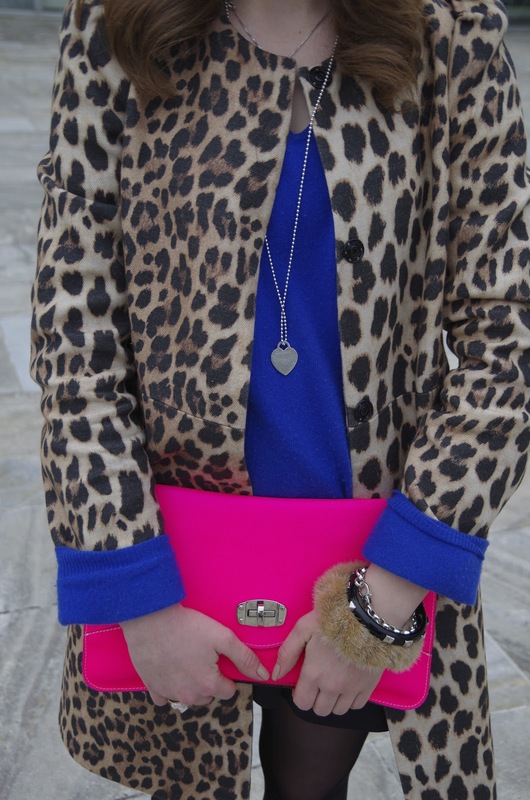 Love Love Love the leopard coat with the neon pink clutch! So nice pics and I really like that coat. Have a great day. OMG! I am like dying for this neon pink, Leo and blue combination! You rock!! i am just loving all of the color going on! beautiful looks!! Just loved the twoo outfits!! The pink hat and the green blazer are my favourites! Loving the leopard and neon pink combo, I might have to recreate a similar look! Gorgeus! I am impressed by yours outfits :)) Would you like to follow each other? and omg the tiffany necklace sooo jealous!!! Style me up gorgeous girls! You are an immensely inspiring! Loving all the pops of bright colors! Aww, the two of you are just so ADORABLE!! Love the leopard paired with the pink and blue...such a striking combination. Great blog! Cute jacket! Loving leopard this season! It looks like you had a great time. I love the accessories. THANK YOU FOR YOUR VISIT ON MY BLOG!love your clutch, follow each other? Thanks for yours words about my blog!!! I like your blog too, are styles totally diferent, but I like it! I follow! I enjoyed this post! Absolutely wonderful pictures. Love your blog! You guys look fantastic! I just stumbled upon your blog, really nice. Will come back for the photos of your trip. I'll wait for you in Daily Life! I am fanatical about the popping colours! I love your leopard coat and pink hat! Wow, you both look amazing! I am loving that stunning leopard print coat and also the gem necklace, with green stones :) It's amazing! Keep up the fabulous work - I can't wait to see pictures from your trip! Great photos. Love the pop of colour. Hey Rachel and Nina! I've nominated you for the Liebster Award! Head over to my blog http://cchicgalore.blogspot.com/ to see what it's all about! I am just really blown away from this one outfit..
Wow Girl! you totally pulled it off. The leoprint with the blue and bright pink.. AMAZING! Have so much fun in the mountains!! You guys both look so cute - love the mint blazer! great outfits, love the leo with neons. looks awesome! Love the leopard coat and the fun statement necklace. Thanks for stopping by my blog! LOOOOOOOVE that leopard coat , just PERFECT! And ofcourse those airmax! Such beautiful pictures. You both look lovely. That necklace with the neon is fabulous and I adore the leopard print coat. I follow you back with GFC and Bloglovin! You look great my dears! i love the pink with the cheetah print! Perfect combination! hi honey! <3 i just found your blog today i think is really cute! :) love you photos and the leo coat is AMAZING with your pink clutch <3 reaaly like it! Thanks for following my blog . Following back yours. Love that pink envelope clutch!